Infinite Art Tournament: Road Trip! 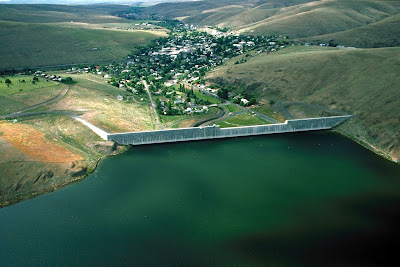 So yes, I was sent out to Eastern Oregon on a business trip Friday, and took the opportunity to take a long, meandering drive home on Friday afternoon and Saturday. Since this was all in Oregon, there was unfortunately no opportunity for county collection -- I polished off Oregon in, what, 1993 I think. But still, there are several roads still I've never been on, so naturally I brought along my atlas of all routes travelled. and Rashneeshpuram -- oops! -- I mean, Antelope (tiny  and pretty much dead on the vine). I stayed in Condon, which is a surprisingly charming and welcoming town of 759. It is a humble but well-kempt and well-preserved place, with a handful of nice shops and the feel of a strong community huddled against the vast empty spaces never more than a few blocks away. 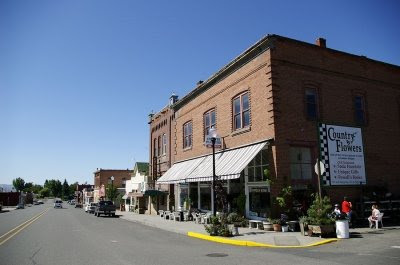 I am also always impressed with the town of Heppner, with its prosperous business district, handsome courthouse, and attractive homes. Despite its proximity to the Blue Mountains, however, I thought that adopting the slogan "Gateway to the Blues" and posting it at all the entraces to town was perhaps not the best choice. Plausible alternative slogan: "To Live in Heppner is to Trust in Hydrologic Engineering." Whoa! No, I'd trust the hydrologists and engineers.....but the concrete contractors, not so much. This is painful to see as after seeing a flyer for RV vacations in the US I have secretly been planning our tour of the Pacific Northwest. Darn if those ticket to San Fran were not £1000 each I would already be on my way. I am liking the alternative slogans! Terrific post. The Oregon dept of Tourism ought to hire you on to do enticement copy. 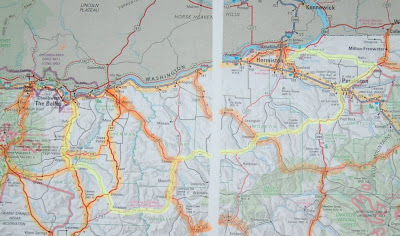 It was always my experience that Oregon outside of Portland was beautiful and fun to drive and walk, but the civilization of the inhabitants was not to be counted upon. Perhaps I was just projecting my own misanthropy. Happy trails! Take the Oregon Trail, and be sure not to die of typhoid.